The ultimate craft brew weekend. Saturday Night: ON TAP is the highlight of the New England Brewfest, but is just one of the many events held during the ultimate craft beer weekend. The New England Brewfest, the ultimate craft beer weekend, is back for its 12th year and scheduled for June 24th-26th in Lincoln and Woodstock, NH. 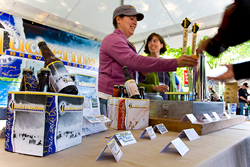 Produced by the Western White Mountains Chamber of Commerce, the New England Brewfest is a one-of-a-kind event in the New England region and offers participants a total craft beer immersion in food, education, and entertainment. The weekend’s signature tasting event, Saturday Night: ON TAP, takes place slopeside at Loon Mountain Resort. Event tickets and weekend packages go on sale April 1st. While events will be taking place throughout the entire weekend, Saturday Night: ON TAP is the “can’t miss” event of this three-day beer celebration. Known as the longest-running beer festival in New Hampshire, Saturday Night: ON TAP will take place slopeside at Loon Mountain Resort on Saturday June 25th, and will feature over 30 breweries from around New England, live music, beer-related vendors, and much more. Along with General Admission tickets, a limited number of VIP tickets will be available and include early access into the festival, official event t-shirt, and swag bag. Lodging and ticket packages will be available through area lodging properties and include shuttle bus transportation to and from the event. Saturday Night: ON TAP is the highlight of the New England Brewfest, but is just one of the many events held during the ultimate craft beer weekend. It all starts on Friday June 24th with two beer pairing dinner experiences. The White Mountains’ newest brewery, One Love Brewery, will host a paired meal inspired by their beer-centric menu. Attendees also have the option of boarding the Café Lafayette Dinner Train for a two-hour train ride, featuring 5 courses, each paired with different craft beer. Saturday’s events start off with a Grapes & Grains Bus Tour where participants will visit and tour the Woodstock Inn Station & Brewery, One Love Brewery, and Seven Birches Winery. In addition to the bus tour, this year the Chamber is excited to add “The Hop Talks” to Saturday’s educational events. The Hop Talks offer a twist on a traditional tasting event that will include five different guest brewers. Not only will there be sampling of their signature beers, but each brewer will give insight into ‘the who, what, why, and where’ on the making of their best beers. The Western White Mountains Chamber is proud to partner with Hop Head United and Brew New Hampshire to bring this event to the 2016 New England Brewfest, with a portion of proceeds going to support the craft beer industry. Sunday events will cap off the weekend with the Hop Talks Brewers Brunch or a scenic gondola skyride to the summit of Loon Mountain for the Believing Brewers non-denominational service. Hop Talks will welcome five different breweries to provide a unique presentation about each of their breweries and how they make some of the best beers in New England. Attendees will get to enjoy a breakfast buffet while interacting with each brewer during this exclusive event. During the Believing Brewers non-denominational service, held at the summit amphitheater on Loon Mountain, Minister Marcus Corey and guest speaker Rev. Jon Paul will host a service on the connection between beer, history, and religion. Rev. Jon Paul’s faith runs through every area of his life, including his 10-year hobby of home brewing and growing hops. He is eager to share the connection between his faith and brewing, and what better place to do so than at the New England Brewfest. The New England Brewfest offers full weekend packages for guests to enjoy a fun-filled destination craft beer weekend as well as individual event tickets. All event tickets and packages will be on sale April 1st. Attendees are reminded to drink responsibly and plan ahead for safe transportation to and from weekend events. Some of this year’s sponsors of the New England Brewfest will include New England Chevrolet, Union Bank, Malone, Dirubbo & Company, Wayne’s Market, Nordic Inn, Harden Law Office, and the New Hampshire Highland Games & Festival. For more information on the 2016 New England Brewfest, visit http://www.NEBrewfest.com or call 603-745-6621.